times, since 24 April 1998. 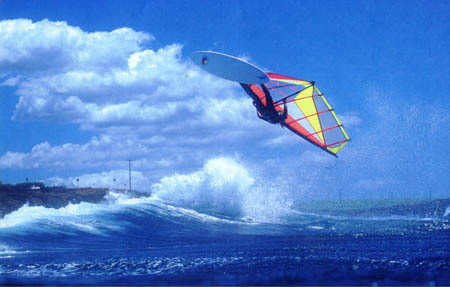 Windsurfing at Raglan: Raglan is situated 30 minutes from Hamilton on the west coast, and is well known world wide for its left hand surf break. Surfing is mainly done at Manu Bay, Whale Bay, Indicators and Brient Home. Windsurfing at Raglan is done at the mouth of the harbour, and it has been nicked named 'suckers' by the locals. This is because on an outgoing tide the mouth is like a river and many people have been sucked out to sea! Jason Prior has compared it to the Gorge in the states and local fishermen think were insane. The bar is one of New Zealand's most dangerous, so care needs to be taken. Raglan works best on a SW and a NW, but sailing can still be done on a westerly. Pipe line, located on the south side bar. Kick named this because it breaks and peals off in 4 foot of water. Works on a westerly swell with a south-westerly. Bar, messy but good jumping. It's recommended that you check your equipment before going out. The tide needs to be going out! and extreme care needs to be taken!!! Wind directions: NW (speed strip), W, SW, E, and NE. The information presented on this Web page is offered to you on a non-commercial base. I do by no means want to inflict any material or non-material damage upon any of the copyright-holders.